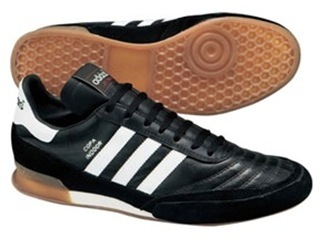 Cousin to the immensely popular soccer shoe Copa Mundial the Adidas Copa Indoor takes the pitch to the streets. These professional indoor soccer sneakers feature Kangaroo leather for durability, lightness, and a glove-like fit. You have to wear them to understand. The outer lining is made of a synthetic material. The inlay has a EVA insole for unsurpassed comfort. The Midsole has a die-cut EVA for lightweight comfort and the outsole is made of a non-marking IN material for use on polished indoor surfaces. This product was added to our catalog on Friday 29 January, 2010.